I just got the sad news that the great Mighty Sam McClain has passed on due to complications from a severe stroke he suffered back in April. Sam had a voice as big as the whole world, and a heart to match. Since I wrote this piece on him almost eight years ago his career had taken off, releasing over a dozen albums and touring all over the planet. Although he was nominated 22 times for a Blues Foundation award (including 12 for 'Soul-Blues Male Artist of the Year'), somehow he never won. 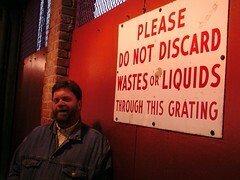 That, my friends, is a crying shame. Rest In Peace Mighty Sam!! Mighty Sam McClain is the genuine article. As one of a family of thirteen children growing up in Winnsboro, Louisiana, he learned early on that life wasn't gonna be easy. Singing with his mother at Church on Sundays taught him the power of song, and helped him realize that he had a special talent. By the time he was in seventh grade, Sam (with the help of his gym teacher) had put together a group of his own, and was earning some money playing parties on the weekends. Maybe his stepfather resented that, I don't know, but he made it a point to try and bring this gifted boy down, telling him that he'd 'never amount to nothing'. Within a year young Sam was gone, setting out on his own to prove him wrong. In 1956, an aspiring Nashville songwriter named Don Gibson recorded a song he wrote called Sweet Dreams (Of You), which made it to #9 on Billboard's Country and Western chart. 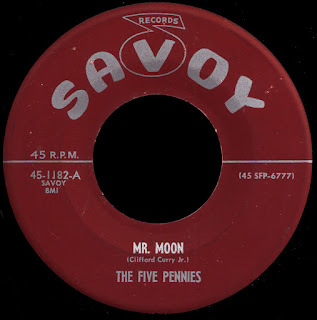 It was picked up later that same year by Shreveport honky tonk hero Faron Young, who would take it all the way to #2, second only to an upstart kid named Elvis Presley. 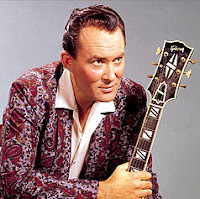 In 1960, Gibson, who was by then a superstar in his own right, cracked the top ten once more with his own newly recorded version. 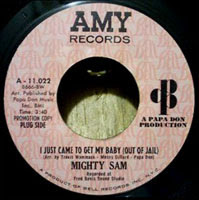 As we discussed a couple of weeks ago, local Pensacola dee-jay Papa Don Schroeder caught Mighty Sam's act at the 506 club in the summer of 1966. 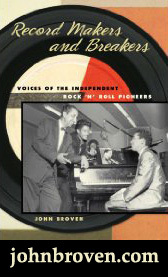 Itching to fulfill his destiny as a record producer, he approached Sam about travelling to Fame Studios with him up in Alabama (where he had cut demos with Rick Hall back in his Nashville days) with him to do a session. Schroeder had set it up for a weekend, when Hall could spare the studio time, but Sam was reluctant to lose a lucrative Saturday night at the club. Finally, he relented, and made the trip to Muscle Shoals with Papa Don and his father-in-law. As Papa Don recalls it, Rick Hall didn't even come in for the session, and it was engineered by Dan Penn. 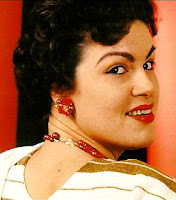 Nobody really had any material ready, and so they worked on a few 'old saws' like Georgia Pines and, yes, Sweet Dreams (Of You). They were feeling pretty good about the results, until, as Sam tells it, somebody walked in with a copy of Billboard, and they couldn't believe their eyes. 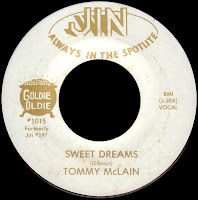 Not only was a version of Sweet Dreams already climbing the charts, it had been recorded by some kid named Tommy McLain who grew up in Jonesville, not fifty miles from Sam's hometown! Pretty spooky stuff, and McClain was convinced his 'career was over', even before it got started. Undaunted, Papa Don loaded everybody into his International Harvester and set out for Nashville, where he still had a few connections. Their first stop was old friend Buzz Cason's office, and he loved the tapes. 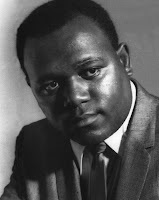 Cason then called Bell Records owner Larry Uttal, who was hanging around Nashville looking for the next big thing. Convinced he had found it, he offered Papa Don and Mighty Sam a contract. 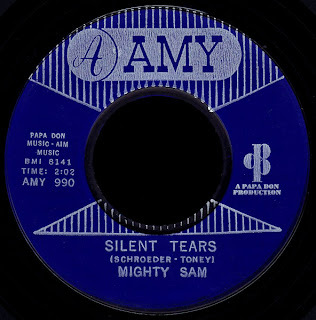 Hastily recording Cason composition Good Humor Man as the B side (as a way of thanking him with the 'mechanicals'), it was released as Amy 957 in the summer of 1966 (in spite of lucrative counter-offers from Jerry Wexler, who was not Uttal's biggest fan). 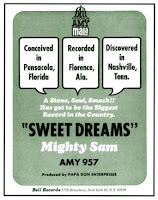 Although not reflected in the Billboard charts, Mighty Sam's version of Sweet Dreams was a big record in spite of (or maybe even because of) Tommy McLain's top twenty hit. Cason's infuence in Nashville (which I'm sure included WLAC), along with Uttal's in New York got it plenty of airplay in those markets. Before long, Sam was playing the Apollo, and things were looking good. 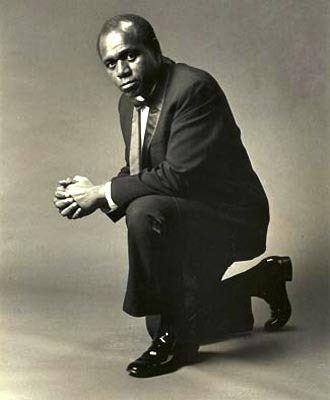 His follow-up record, a high energy cover of Buster Brown's 1959 #1 R&B smash Fannie Mae, kept him popular out there on the circuit, although it once again failed to dent the charts. On a return trip to Pensacola, Sam made what he feels may have been his biggest mistake when he took Papa Don to see The Dothan Sextet at his old haunt, Tom's Tavern. Schroeder, just as he had done with McClain, lured James Purify and Robert Dickey to Muscle Shoals, and the rest is history. After they hit the big time with I'm Your Puppet, Sam says he 'couldn't even get Don on the telephone'. When I told Schroeder (who was kind enough to leave a comment a couple of weeks ago) I was going to write this piece, he emailed me & said, "Mighty Sam was a very important part of my life. Unfortunately, he never did forgive me for not doing the same for him that I was able to do for the Purifys, Toney... etc. but God knows I tried. Sweet Dreams and Fannie Mae were the closest..."
Nothing if not persistent, Papa Don would continue to release 'product' on Mighty Sam right up until the day he walked away from Uttal and Bell/Mala/Amy in 1969. Listening to these records today, as I said, it's hard to imagine why they didn't meet with greater success. You can check them all out on the excellent Sundazed CD Papa True Love - The Amy Sessions. 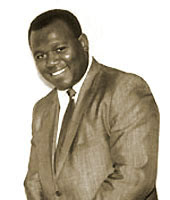 Once Papa Don had left the business (temporarily), Mighty Sam began working with his 'right hand man', Charlie Capri. Wexler finally got his wish, as Capri got Mighty Sam a deal with Atlantic Records in 1970. After only two singles that didn't make the charts (one of which was included on Atlantic Unearthed: Soul Brothers last year), the big company lost interest, and dropped him (maybe going with Uttal wasn't such a bad idea after all). 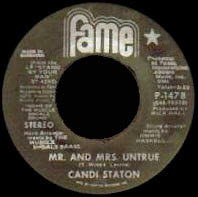 Capri's next stop was Malaco Records in Jackson, Mississippi, where they recorded the great cheatin' song Mr And Mrs Untrue. 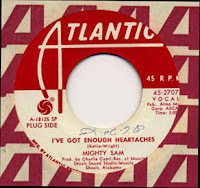 Atlantic was the Malaco distributor at that point, and refused to pick up the single on an artist they had just cut loose. Malaco decided to release it anyway and, in what must have seemed like 'deja vu all over again' to Sam, they watched in disbelief as Candi Staton's version of the same song appeared on Fame around the same time. Candi's record climbed all the way to #20 R&B, while Sam's died on the vine. Unreal. 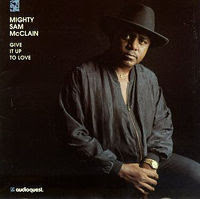 As the market for his kind of music began to disappear in the mid-seventies, the once mighty McClain sank into a dark and desolate period that found him living on the streets, and eating out of garbage cans. 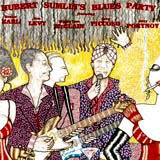 Drifting to New Orleans, he came to the attention of The Neville Brothers, who were instrumental in getting him recorded by the small Orleans label in 1984. An album would follow a few years later, after which Sam was invited to perform in Japan. 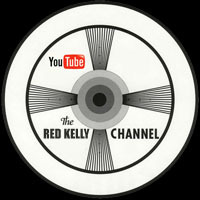 A live LP (which featured Wayne Bennett on the guitar) was released by Japanese label DeadBall in the mid-eighties. 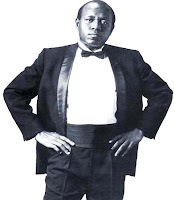 All of this brought him to the attention of Hammond Scott, and he became the featured vocalist on the 1987 Black Top release Hubert Sumlin's Blues Party. Although this is probably what caused Sam to be categorized from that moment on as a 'Blues' artist, at least he was working again. Relocating to Houston, he tried his hand at real estate, but the music was in his blood. A move to Boston in the early nineties was followed by the critically acclaimed Audioquest album Give It Up To Love in 1993. Now able to support his own band, Sam found regular work in and around New England, as well as touring the European 'festival circuit' every year. Moving to southern New Hampshire, he put down roots, and has continued to release great records right up to the present day, forming his own record label and production company in 2003. 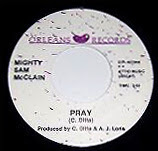 An unashamed Christian, Mighty Sam's music refuses to be categorized, and contains elements of Gospel, Blues and Soul, in a true reflection of what lives in his heart. As a way of giving something back, his latest project has been to join in the Give Us Your Poor campaign to end homelessness. In addition to appearing on the album (released this past September), he'll be performing at the benefit concert this Friday, November 16th at the grand re-opening of the Strand Theater in Boston.